The cells in our bodies are constantly sending out and receiving signals. But what if a cell fails to send out a signal at the proper time? Or what if a signal doesn&apos;t reach its target? What if a target cell does not respond to a signal, or a cell responds even though it has not received a signal? These are just a few ways in which cell communication can go wrong, resulting in disease. In fact, most diseases involve at least one breakdown in cell communication. Normal blood sugar regulation. After food enters the body (1), it is broken down and sugar enters the bloodstream (2). Sugar stimulates cells in the pancreas to release insulin (3). 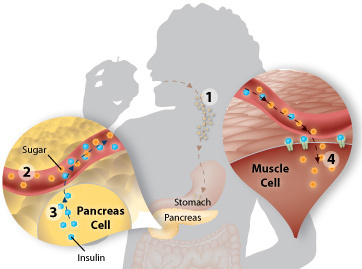 Insulin travels through the blood to other cells in the body and signals them to take up sugar (4). The food that you eat is broken down into sugar, which enters the blood stream. Normally, cells in the pancreas release a signal, called insulin, that tells your liver, muscle and fat cells to store this sugar for later use. In type I diabetes, the pancreatic cells that produce insulin are lost. Consequently, the insulin signal is also lost. As a result, sugar accumulates to toxic levels in the blood. Without treatment, diabetes can lead to kidney failure, blindness and heart disease in later life. Multiple sclerosis is a disease in which the protective wrappings around nerve cells in the brain and spinal cord are destroyed. The affected nerve cells can no longer transmit signals from one area of the brain to another. The nerve damage caused by multiple sclerosis leads to many problems, including muscle weakness, blurred or double vision, difficulty with balance, uncontrolled movements, and depression. Type I and type II diabetes have very similar symptoms, but they have different causes. While people who have type I diabetes are unable to produce the insulin signal, those with type II diabetes do produce insulin. 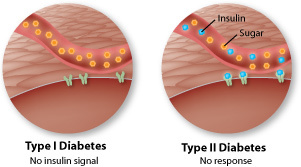 However, the cells of type II diabetics have lost the ability to respond to insulin. The end result is the same: blood sugar levels become dangerously high. Excitotoxicity: After a brain injury such as a stroke, lethal amounts of signaling molecules leak out of dying nerve cells resulting in widespread damage to the brain. 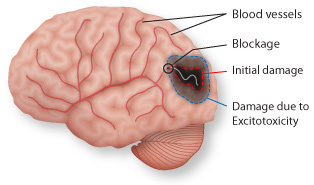 A stroke occurs when a blockage forms in a blood vessel, cutting off blood flow to part of the brain. The immediate result is the death of nearby brain cells. But the most catastrophic event comes later, when the dying cells release large amounts of the signaling molecule glutamate. Low concentrations of glutamate control many actions in the brain, but at high concentrations it is toxic to cells. Through a process called excitotoxicity, glutamate spreads through the brain and kills cells that were not affected by the blockage, often leading to widespread brain damage. Many mechanisms maintain appropriate cell growth: Cell division occurs in response to external signals (1). 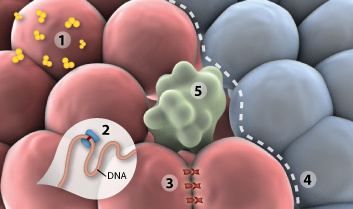 Enzymes repair damaged DNA (2). Cells make connections with their neighbors (3). If these connections suddenly change, neighboring cells send out an alert. Cells respect and stay within tissue boundaries (4). If a cell is beyond repair, it initiates its own death (5). Cell growth and division is such an important process that it is under tight control with many checks and balances. But even so, cell communication can break down. The result is uncontrolled cell growth, often leading to cancer. Cancer can occur in many ways, but it always requires multiple signaling breakdowns. Often, cancer begins when a cell gains the ability to grow and divide even in the absence of a signal. Ordinarily this unregulated growth triggers a signal for self-destruction. But when the cell also loses the ability to respond to death signals, it divides out of control, forming a tumor. Later cell communication events cause blood vessels to grow into the tumor, enabling it to grow larger. Additional signals allow the cancer to spread to other parts of the body. During an asthma attack, signaling molecules cause a narrowing of breathing passages in the lungs, making it difficult to breathe. Many drugs that treat asthma mimic natural signals that tell muscle cells in the lungs to relax, allowing breathing passages to open. Just as cell communication can go wrong resulting in disease, many disease treatments rely on cell communication. If you think of disease as a roadblock in cell communication, treatment is an alternate route. The first step is to locate the problem. The second step is to find a way around the problem. Sometimes it&apos;s easy. The treatment for type I diabetes is to inject insulin into the blood stream. Other times it&apos;s more difficult, especially in diseases such as cancer where cell communication has broken down in multiple places. Genetic Science Learning Center. "When Cell Communication Goes Wrong." Learn.Genetics. September 2, 2010. Accessed April 18, 2019. https://learn.genetics.utah.edu/content/cells/badcom/.